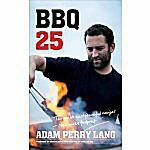 Adam Perry Lang's last BBQ book was a 400-page opus of outdoor cooking in which he took his experience as a gourmet chef and restaurateur to the grill. Now we have the opposite approach to grilling. BBQ 25 is a 68-page cardboard printed book (it would be a pamphlet on regular paper) that offers up 25 "foolproof" recipes for the grill. Since few people cook more than a couple of dishes on the grill it makes sense to distil the grilling cookbook down to this level. What each recipe provides is more than just the ingredients but a detailed process for making the most of everything from rib-eyes to vegetables. Take Adam's recipe for a Hamburger. Such a simple item that most people don't even think to look for a recipe when they set out to make burgers, but Adam adds a new depth to the process. You take 2 1/2-pounds of ground beef (80/20), add in cold water and form into patties. Season "like rain" as he says and place them on a heated griddle on your grill with oil (canola or vegetable here, no EVOO so take that Food Network) and butter where you have already sauteed onions. After searing on the griddle (where he does all his searing) you flip to the open grill to finish off the burgers. Top with the onions, now mixed with fresh parsley, top with a slice of cheese if desired, and remove when the cheese is melted. I'm assuming you'll be adding the cheese because the picture in the book, labeled "crowd pleaser" is too good to pass on. Each of the 25 recipes in this little book is approached in this manner. Out go the old preconceived notions and in comes a new, practical if a sometime elaborate process to grilling old favorites. While primarily a grilling book you do get recipes for whole brisket, pulled pork, and smoked ribs though they are all done on a basic charcoal grill. As I said this book is printed on cardboard. It's like those picture books you buy for toddlers that can be easily wiped off and that they can chew on without greatly damaging. Of course this makes it a nice book to keep by the grill because any sauce dripped on it can be quickly cleaned up. Looking skeptically this book is only 68 pages long (subtract 8 pages for chapter splash screens for 60 usable pages) and you get something as long as those cheap little recipe books you find in the grocery store checkout line. What separated this book from those is the amount of information that is packed into it. In some places I find the font small enough to have me looking for my reading glasses that I'm typically too proud to carry around. Each recipe has the necessary list of ingredients and the step by step instructions on how to put it all together, but there is also a series of icons telling you the tools required and the techniques you will use. You will have to refer back to the beginning of the book to interpret phrases like "buddy system" and "super aggressive seasoning", but after a few recipes it becomes more natural. Because of the small size of the book and the amount of information packed in, some of the more complicated recipe pages have some overlapping and the pictures, done in that super close up style you see in British cooking shoes, can be a little small to really see what is going on. Don't worry, though, this isn't rocket surgery and the instructions are detailed enough to see you through all 25 recipes. One of the problems of grilling cookbooks is that they try to be general enough to be adaptable to whatever kind of cooking equipment you are using. To say that BBQ 25 favors charcoal would imply that anything else is even suggested. This is a book built around the charcoal grill, pretty obviously the Weber Kettle grill. Adam states that the "ideal heat source" is natural lump charcoal with some wood chunks thrown in when smoke is needed. This isn't to say that an experienced gas griller would have difficulty adapting the processes for their grill, but the presupposition here is that you are using a basic charcoal grill. I supposed that the influence here comes from the Jamie Oliver's (who wrote the forward) school of back to basics. As Adam says in this introduction this is that "Like most guys, I'm into gadgets..." "But less is often more". So while this book tries to strip away all the fancy cooking we have been tuning into these days, there are a number of gadgets going on in this book. Bacon presses, griddles, wood planks, and fire-proof pans are part of the "foolproof" process. You see, this is really what those of us who love to grill need, a book that isn't filled with recipes, but the basic, best success technique. Adam gives us this. The book might be a little gimmicky, but it does deliver what it promises, the barbecue process, streamlined. 68 pages for a list price of $20USD (though you can find it for about half that by hitting the compare prices link on this page) works out to about 30 cents a page. You wouldn't spend that much for War and Peace. So is this little book worth it? Well, that depends on the kind of person you are. If you are that guy (or gal) who throws premade burger patties on the grill with a side of hot dogs for the kids and calls that the big cookout of the year then you don't need this book. Don't buy it and if someone gives it to you, take it back. I'm not saying that there is anything wrong with this kind of cookout. It's how most of us do it because a cookout isn't as much about gourmet food as it is about the experience. However, if you are the person who loves to grill, and maybe more importantly loves to cook, then this really is a valuable book. These 25 recipes will serve you well for many years and the lessons learned from mastering these "master" recipes will take you to a whole new level of grilling.